The Governor and I would like to take a moment in this busy holiday season to wish each and every state employee seasons greetings. It is our hope that you and your family will find the holiday season filled with joy and happiness. During the past year I have traveled the state extensively, introducing some of the department’s new leadership team, meeting with legislators and community leaders, seeing firsthand the accomplishments of each district and getting to know many of you better. “Our Mission. Your Mobility.” Clear, concise and direct, the four words were chosen recently to serve as ITD’s mission statement. They remind employees and the public that our highest call as a state department is to ensure mobility options. A year ago Pam Lowe was making another transition. She was named director of the transportation department in December 2006 and officially assumed the duties in early January. Lowe made similar transitions from staff engineer to district engineer to division administrator, to deputy director. The Local Rural Highway Investment Program, similar to ITD’s Statewide Transportation Improvement Plan, helps small cities, counties and highway districts improve their investments in public highways and streets. Jim Zier, asset manager for the Local Highway Technical Assistance Council (LHTAC), presented a report on the annual plan to ITD’s transportation board when it met in Boise Dec. 12. Learning to apply classroom concepts to real-world challenges is the goal of a unique training partnership launched recently by ITD volunteers and Nampa School District teachers. ITD engineers joined with teachers from Nampa’s Columbia High School in activities ranging from building simulated cities to gliding “race cars” down a magnetic track. The newest version of Microsoft’s web browser will be deployed at ITD starting after the first of the New Year. We will start rolling out Internet Explorer 7 (IE7) in Corporate IT followed section by section for the rest of the department. The district IT Coordinators will be responsible to rollout IE7 within their respective districts according to the schedule created by the IE7 project manager. In 1832, befriended by Nez Perce and Flathead Indians, Cpt. Bonneville and 13 fellow trappers found safety and bountiful game in the Stanley Basin from Dec. 9 through Dec. 26. Historical records note "an elaborate Christmas celebration with the Nez Perce, who joined enthusiastically in the celebration." A decade later (1842). Idaho’s intrinsic beauty will get a little more attention as a result of federal funding announced last week that enhances the state’s scenic byway system. Garry Young, coordinator of the transportation department’s Idaho Scenic Byway program learned Friday that nine of 10 projects submitted to the Federal Highway Administration earlier this year were approved for funding. Approved by the Idaho Transportation Board in October, the Snake River Canyon Scenic Byway becomes the 28th route on the state system and the first that focuses on the contribution of agriculture to Idaho’s economy. It traverses the vineyards and orchards of southwest Idaho, beginning at Idaho 45, follows Map Rock Road and continues to the Snake River that separates Oregon and Idaho. The view from Gordon Wilmoth’s office hasn’t changed much the past six months … but it’s about to. Wilmoth became acting Controller in September when David Tolman vacated the position to become acting administrator for the Division of Administration. After Tolman’s position became permanent, Wilmoth sought to make his official as well. Between the state and federal computers that flank Joan Benzon in ITD’s Office of Highway Operations and Safety, sit three national awards that recognize consistently great work that she performs for Idaho. 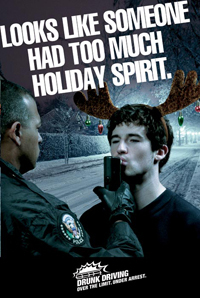 Keep your holiday season merry, just don’t overdue it. Law enforcement agencies throughout Idaho will step up patrols to catch and arrest impaired drivers during the holidays.